The Microsoft Surface Keyboard is an excellent – though pricey – accessory for people who work on their Windows 10 tablet. Microsoft has released the Surface Keyboard, a full-size keyboard aimed at making typing on the Surface Pro 4 more comfortable. While Microsoft’s latest Surface Pro tablet does a good job of replacing your laptop, its Type Cover is pretty expensive at £135 (around $190 or AUS$260), and doesn’t quite manage to replicate the typing experience of a proper keyboard. To help make the Surface Pro (or any Windows 10 tablet, as the Microsoft Surface Keyboard is compatible with those that have Bluetooth) a more viable laptop replacement, Microsoft has created the Microsoft Surface Keyboard, which goes on sale for $99.99 (£89.99, AU$159.95). That’s quite a bit cheaper than the Type Cover, though of course this keyboard doesn’t double as protection for your precious tablet. It’s still a bit pricey for a keyboard, but Microsoft has a pretty good reputation when it comes to making peripherals, and if it can bring a little bit of its magic to the Surface Keyboard then the price could be justified. The Microsoft Surface Pro 4 is a good-looking and premium-feeling tablet, and Microsoft has made a similarly attractive peripheral with the Microsoft Surface Keyboard. It has a silver and gray color scheme, and the metal back feels nice and sturdy. For the most part the keyboard is very slim, measuring just a few millimetres in height except for the top end of the keyboard, where a rounded stand runs almost the entire length of the peripheral. In addition to raising the rear of the keyboard for more comfortable typing, this also holds the two AAA batteries that power the keyboard. The batteries are included, and can be replaced by removing the cover, which is connected to the keyboard’s body by a magnet – a nice little touch which helps to make this device feel premium. The keys are gray plastic, and although slim they still have enough travel in them to feel responsive when typing. Both the keyboard and its keys are full size, which makes the Microsoft Surface Keyboard almost as comfortable to work on as a standard keyboard. It certainly doesn’t feel cramped to use, like some designed-for-tablets keyboards can. However, this does mean the keyboard is quite a bit longer than the Surface Pro 4, making it unwieldy to carry about with you. 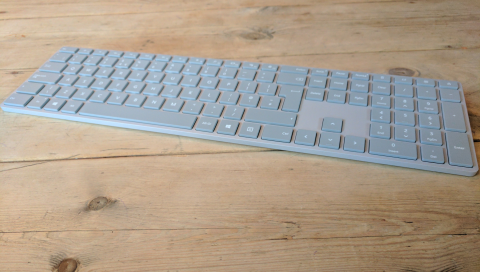 The design of the Microsoft Surface Keyboard suggests that the best way to use it is to keep it on your desk, then connect it up when you’re sat in the office, rather than taking it out and about with you. We’d hazard a guess that in Microsoft’s ideal world you’d use a Microsoft Surface Keyboard at home or in the office, then use the Type Cover when out and about. A lovely thought, sure, but the high price of these keyboards means that having both won’t be a viable solution for many people. Overall this is a good-looking – and premium-feeling – keyboard, but one that you’re unlikely to carry around with you. So what's the Microsoft Surface Keyboard like to use? First of all, installation is very easy – you simply remove the plastic slip by the batteries, then use the Windows 10 Settings app to add the Bluetooth device. There’s no Bluetooth dongle included, which is handy in some ways as it means you have one less thing to carry around and potentially lose. The Surface Pro 4, like pretty much all tablets, has Bluetooth built in, so the setup procedure should be pretty straightforward – Windows should find the keyboard, then ask you to type a displayed code. Once it's connected, you’re good to go. Of course, if you have a machine without Bluetooth then you’ll need a dongle to get it to work, which will be an extra expense. With the Microsoft Surface Keyboard connected, typing is fast and responsive, with no noticeable lag or ghosting, which is when two or more keys are pressed together, or very quickly one after the other, yet the keypresses aren’t registered by the computer. Ghosting is mainly a concern for people playing games, and while we wouldn’t recommend the Microsoft Surface Keyboard for gamers, it’s responsive enough if you do want to play a few games when you’re not working. Thanks to the full size of the keyboard it's also comfortable to work on for long periods of time. We also tried the Microsoft Surface Keyboard with a non-Surface Windows 10 tablet, and it worked just as well as it does with Microsoft’s own device. The Microsoft Surface Keyboard is a well put together keyboard that makes typing on the Surface Pro – or any other Windows 10 tablet – fast and comfortable. While the large size of the keyboard hampers portability, it does mean you don’t feel cramped when typing for long periods of time – which can cause RSI and other types of injury. The Microsoft Surface Keyboard is pricey, and there are cheaper alternatives out there. Also, because of its size, you’re unlikely to carry the Microsoft Surface Keyboard around with you much, so you may need to invest in a smaller, more portable keyboard as well. The Microsoft Surface Keyboard is a very nicely made bit of kit, and if you spend a lot of your time at a desk working on your Surface Pro 4, or other Windows 10 tablet, then it's definitely worth considering. As with other Microsoft peripherals, build quality is excellent, and setting it up in Windows 10 is very easy. You’re unlikely to carry it around day-to-day, but it is thin and light enough to pack in your suitcase when travelling, so if you don’t mind paying the price premium you may find this an excellent tool for boosting your productivity when using a tablet for work.